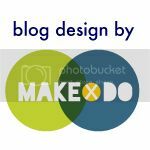 So what do you do when your 8 year old and your 2 year old have birthdays four days apart? Why you have a joint birthday, of course. And since both of their birthdays fall in the week of Christmas, we have our birthday party a month later. And how do you do a party that satisfies an 8 year old boy and a 2 year old girl? 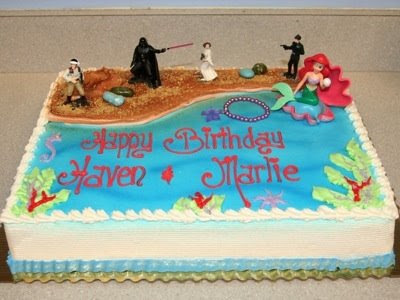 Why you have a Star Wars/Little Mermaid party, of course. My very talented sister made the custom party invitations and my very talented local grocery store bakery made the awesome cake. (chocolate cake with oreo filling... yum!) We got Star Wars goodie bags for the boys and Little Mermaid goodie bags for the girls. Star Wars balloons for the boys, Little Mermaid balloons for the girls. 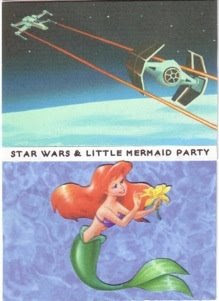 I got a Star Wars birthday banner and a Little Mermaid birthday banner. I made a custom party music mix, with every other song alternating between the Star Wars and Little Mermaid soundtracks. It was awesome. “Imperial attack” meets “Under the Sea”. We had the party at the local play gym. That way I didn’t have to set up before or clean up after. And in the worst timing ever, our dear former Gymboree teacher/manager of the play gym quit the week before the party. Right after that happened, Marshall found out he HAD to work that weekend and would miss the party. But the party ended up being as good as it possibly could be without “Uncle Stan” and “Daddy”. Only their presence could have made it better. It was incredibly fun and the kids had a blast. What more could I ask for? Of course I was pulling triple duty as party host, mom of three kids and photographer, so the pictures aren’t quite up to Marshall’s standards. We hired an entertainer Anakin Skywalker to lead organized games with the kids. A good percentage of the kids are recent adoptees from Ethiopia, so the whole Anakin costume/Star Wars theme was completely lost on them. Haven really enjoyed him though. Of course Marlie freaked out when Anakin showed up and started screaming and crying and tried to climb up my leg. Very difficult to hold a screaming child while taking pictures with Marshall’s macho-huge-lens-photographer’s camera. And silly me... 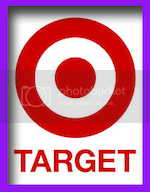 I forgot all about the fact that I had just started potty-training my 3 year old son the entire time we were there. But bless his little pirate heart... he held it all in, and his pants were clean and dry when we got home. Marlie continued to freak out whenever she was near Anakin. He tried his best to win her heart, but even making her the most elaborate shaped balloon didn’t work. She had a good time most of the time, as long as she kept an eye on Anakin and made sure she remained a certain amount of distance from him. In the end, I think it was the best kid birthday party we’ve ever thrown in the 8 years we’ve been parents.